Vitamin K Deficiency is exactly as it sounds. It refers to inappropriately low levels of the fat soluble vitamin K vitamin within the body. This can be caused by a dietary issue, malabsorption from conditions such as pancreatic insufficiency (proper absorption of fat is needed for vitamin K absorption), or even long term antibiotic therapy that disrupts the vitamin K producing bacteria of the gut. Another very common cause of functional vitamin K deficiency is overdose of Warfarin (which will decrease levels of active vitamin K in the body). Vitamin K is essential for the production of many clotting factors (II, VII, IX, and X) as well as some fibrinolytic factors (protein C, protein S which actually inhibit Factors V and VIII). All details aside, its deficiency leads to decreased synthesis of all of these factors. This predisposes patients to a hypo coagulable state, and increases the chance of bleeding. Unusual/frequent bleeding: a very broad statement, however any unusual hemorrhages or episodes of bleeding should warrant investigation of the possibility of vitamin K deficiency. Clinical presentation can be common to hemophilia A and hemophilia B. Any site can be involved for bleeding episodes, so manifestations can include mucosal and subcutaneous bleeding (bloody noses), hematoma, GI bleeding, heavy bleeding during menstruation, hematuria, gum bleeding, and oozing from venipuncture sites. Easy bruising also is observed. Coagulation studies: use this guide as a reference to interpret the below findings that one would see in Vitamin K deficiency. Measurements of des-gamma-carboxy prothrombin (DCP): this is also known as protein induced by vitamin K absence (which will be elevated in its deficiency). Serum vitman K: the presence of vitamin K can be assessed in the blood, however it varies greatly based on diet. With this in mind, very low levels can suggest low tissue stores of vitamin K.
This depends entirely on the underlying cause of the deficiency, however strictly speaking the vitamin K deficiency can easily be addressed with vitamin supplementation. 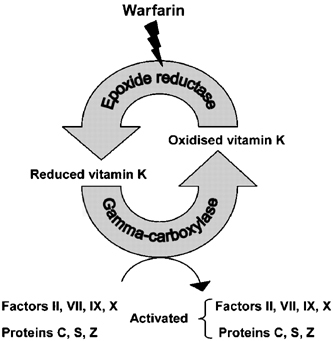 Proper dosing of Warfarin therapy will prevent the common functional vitamin K deficiency. Eating leafy green vegetables can also address some dietary issues of vitamin K deficiency. Pancreatic insufficiency: given that vitamin K is a fat soluble vitamin, and requires proper absorption of fat for its own absorption, pancreatic insufficiency can cause its defiance. Make sure to keep an eye out for any signs of pancreatic insufficiency for patients with vitamin K deficiencies. Neonates lack enteric bacteria, which produce vitamin K. This puts them at an increased risk for hemorrhage if they are not given a vitamin K injection at birth (which is the standard of care). It is important to note that vitamin K is not in breast milk.